Zachariah (Zach) George is the co-founder and Chief Investment Officer of Startupbootcamp Africa – the leading multi-corporate backed and mentor-driven venture accelerator program in Africa. In 2013, he founded Cactus Advisors – an Angel investment fund and business advisory firm in Cape Town focused on high impact, high growth early stage businesses in Africa. In 2015, Cactus Advisors created, developed and managed the first ever corporate tech accelerator program in Africa – the Barclays Tech Lab Africa accelerator program designed to discover, nurture and empower the next generation of technology innovators, and subsequently managed the Allan Gray Orbis Foundation’s incubator and accelerator program. Zach has advised numerous African start-ups and businesses since 2010 and is and Angel Investor in several African tech startups. From 2011 to 2014, Zach led the Africa operations of U-Start - a Swiss based global investment advisory firm specializing in direct and indirect venture capital investments in the tech and digital sector for private investors (family offices and high net-worth Individuals) as well as VC funds, corporate ventures and wealth management institutions. Zach was formerly an Asst Vice President at two of the largest bulge bracket Wall Street firms in New York - Lehman Brothers and Barclays Capital - where he worked as an investment banker covering Mergers and Acquisitions, IPOs, Risk Management and Strategic Corporate Finance. In May 2010, he voluntarily left the global financial sector and moved to Africa where he spent a year consulting to micro-finance organizations and impact-driven venture capital enterprises, including a 6-month stint as a Professor of Finance for an Ashoka award winning Social Entrepreneurship MBA program in Nairobi. Since August 2011, Zach has been based in Cape Town where he is a specialist business consultant and financial advisor to senior management teams at corporations, banks, financial institutions, impact investment funds and enterprise development institutions. In 2014, Zach was recognized as a Certified Business Adviser at the Institute of Business Advisers for Business Advising Excellence and is a member of the Institute of Directors in Southern Africa (IoDSA). 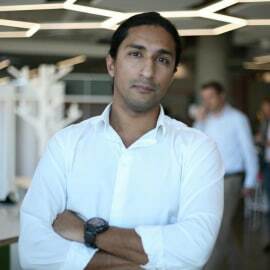 He is a mentor for High Impact Endeavor entrepreneurs and has been featured on CNBC Africa on several occasions as well as on Disrupt Africa , Cliff Central , Entrepreneur Magazine and Silicon Cape. Prior to his Wall Street career, at the age of 22, Zach got his Master’s degree in Management Science from Stanford University, California specializing in Corporate Finance. During the course of his degree, he was invited by the United Nations Secretariat to work on U.N. projects for the Department of Management and Procurement in New York. Zach is a Mechanical Engineer from the Indian Institute of Technology and a member of MENSA International – The Global High IQ Society. He has lived and worked in the Middle East, California, New York, India, South Africa and Kenya. Outside of his professional life, Zach is an acoustic guitarist/vocalist with an acoustic cover album on iTunes released in 2010. He loves art and theater as well as the adventure and outdoor junkie, having most recently run the New York and Cape Town marathon and summited Mt. Kilimanjaro. Zach is a dad to three children and lives in the coastal suburb of Lagoon Beach just outside of Cape Town.